High be your aim in life’s onward view ! With rever’nce meet to your shepherds true! E’er loyal and staunch, or win we, or fall ! Though the College itself is a 140 years old, the Anthem dates back to just 90 years when Bro. Cyprian was Director. Written by Proctor Mr. C.E.M. Jayawardene, who later became a district judge, the song was set to music by S. Norbert Rodrigo, at the time a teenager in the middle forms. Hailing from a brilliant musical family (his father Mr. William Rodrigo was bandmaster of the Ceylon Volunteer Force) it was a casual announcement by Bro. Lewis, the College Choir Master, that a competition would be help to select a suitable musical composition for the Song that prompted young Norbert to submit his entry, putting himself against such musical giants of his time as bandmaster Adams of the Ceylon Police Force, Bro. Edwin and his own father. At the final judging, everybody was taken aback when Norbert’s composition was adjudged the best. Here was a lad whose knowledge of music did not go beyond the Smallwood’s Piano Tutor. Here was a mere bugler in the College Band putting top grade bandmasters in the shade. Young Norbert’s success in beating his teachers at their own game did not go unrecognized. It was a proud day for Norbert when Bro. Cyprian, the Director, awarded him a bronze medal. …His success at school only proved to be precursor of brilliant events in later years. With an A.C.V.M. (London) qualification, Norbert Rodrigo emerged as an all-rounder. He was a pianist, organist, Choirmaster, Bandmaster, violinist and above all a vocalist. 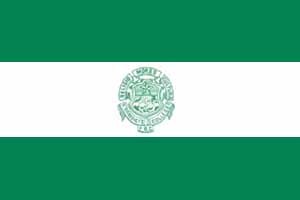 While it is difficult to place a date of origin of the College Crest, the designer is also unknown at this time. However, it is a unique piece of design and carries profound meaning. The crest consists of a shield depicting two prostrate elephants elevating a Cross in the clasp of their trunks. The elephants are a native symbol Sri Lanka, also a symbol of strength. It also signifies nature’s veneration of the Creator. The Cross is a synergy of all the virtues sought after by humanity. And Religion, Christianity – the primary thrust of the motto. Over the Cross hangs a Star – showing the ‘onward view’, the upward path to look up to, the aim, the reachable goal. To the left, between the star and the Cross is a mountain peak – again pointing towards the pinnacle of achievement, the high ideals to strive for. To the right is a tree – for culture, respect for nature, the environment, the world we live in, the ethos of loving our neighbour in the natural order of things. All of this is set in the embrace of two curling ribbons. The ribbon above the shield bears the College motto Religio, Mores, Cultura and the ribbon below carries the College name and the letters F.S.C. which is the Latin abbreviation for Brothers of the Christian Schools – Frater Scholaticum Christianorum. From the time I joined St Benedict’s College in 1919 up to 1922, the colors of the College flag were Blue, Gold and Black. But Bro. Wulton James, the new Irish Director, said a college must have two colors and not three. So he changed the College colors to Green and Sky Blue – green, the Irish color and sky blue for hope. That’s what the Director said. “Bearing the cross with the crown in view” goes the final line of the College Anthem lustily sung by over 2000 students regularly, reflecting a philosophy of the 140 year old Catholic Educational institution – St. Benedict’s College. Cradled under the shadow of the imposing dome of St. Lucia’s Cathedral of Colombo Archdiocese, the well laid rectangular buildings surrounding the vast quadrangle on three sides is literally metaphorically situated on a hill – top, like a light house. In 1863 the cornerstone of St. Benedict’s College was laid by His Lordship the Rt. Rev. Charles Hyaciatus Valerga, the Administrator of Colombo Archdiocese. The building planned by Sylvestro – Benedictine Monks, in the style of an Italian Benedictine monastery was completed in 1865, signaling the birth year of the College. During the end of the first year there were 368 boys, 170 girls and four teachers. La Sallian entry on January 16, 1867, with Brother Hidulphus, with two other De La Salle Brothers took charge of the school. Since then De La Salle Brothers have not only managed this school, but also assumed management of several colleges in different parts of the Island. Heading St. Benedict’s were Brothers from France, England, Ireland, USA, Sri Lanka and other countries. Within fifty years St. Benedict’s College, emerged as a premier institute of excellence, producing outstanding academic results. Peter A. Pillai – who later became a priest, topped the list in the London Matriculation Examinations in the entire British Empire. Sir Thomas de Sampayo became the first Ceylonese Chief Justice. Sir Marcus Fernando the first physician to obtain a MD winning the gold medal. The string of firsts included Orthopedic Surgery, Bacteriology, Tropical Medicine, Physics, Agriculture, Journalism, Accountancy, Commerce, Film and Music. 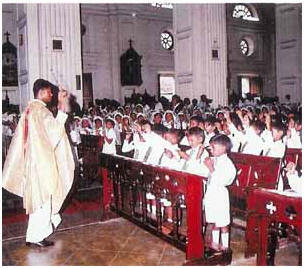 The first Sri Lankan Bishop was old Benedictine, Rt. Rev. Dr. Bede Beckmeyer OSB and so was Rt. Rev. 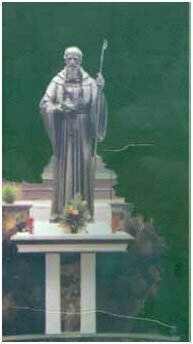 Dr. Tiburtius Roche, India’s first Latin Rite Bishop. St. Benedict’s not only produced several Priests, Brothers and Bishops but also some illustrious Buddhist monks including the globally renowned Rev. Narada Thero. A radically deviant State education policy in the early sixties saw the Catholic Schools in the country taking a direct hit. Hundreds of parish schools were taken over in a swift move. A few Catholic Schools opted to go private. Denied government grants to cover teacher salaries and prevented from levying schools fees these schools faces Herculean challenges, even merely to survive, let alone maintain high standards. St. Benedict’s College was o n such institution. The story of it’s survival is all the more legendary considering that a substantial number of students came from less affluent families. The situation was partially reversed two decades later when the government restored grants, partially. Yet the impact of the hard times till lingers on. A process of renewal and revival has been set in motion since mid 1980’s. With the help of the La Sallian Community as well as the teaching and administrative staff, past students and other bodies, efforts are underway to develop the quality of teaching, training and molding to achieve excellence. Academics, sports, extra curricular activities, spiritual and psychological formation are already bearing fruit. Moreover, several infrastructure development programs are now in full swing. Starting from 3 story building for the senior section in 1990, followed by a 4 story edifice for the primary school in 1999 and another 5 story building for the senior school in 2003. A massive playground upgrading project has also commenced. Indeed structural expansion has become an important item in the development plan of the college. Sri Lanka has a 3000 year religious tradition further strengthened by the arrival of Buddhism, Islam and Christianity. 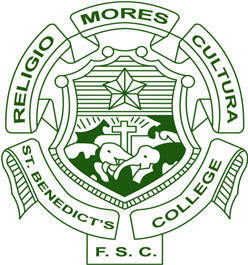 In such a spiritual environment, it is not strange that St. Benedict’s College possesses the motto “Religio, Mores, Cultura”. Being situated with the Cathedral Square, the students take a leading role in all the liturgical services of the Cathedral. Several pious associations including the Legion of Mary, Vincent de Paul Society (to help the poor), Student Christian Movement are thriving.